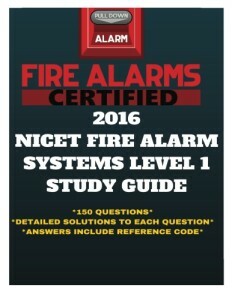 Don’t take the NICET Fire Alarm Systems Level 1 Certification Exam until you study this guide! *This NICET Level 1 Study Guide includes 150 questions referencing the NFPA 72 2013, NEC 2011, OSHA standards and technical/theoretical disciplines. *Each question is accompanied by the answer and the standard or section of the code (NFPA, NEC and OSHA). *Each question is a multiple choice (4 choices) similar to the format of the actual NICET exam. *Questions are challenging enough to test your readiness. This study guide helps you prepare more efficiently for the exam.